Building research-stations on Antarctica must also have his impact on the environment. Since the signing of the Antarctic Treaty in 1959, Antarctica is only used for peaceful and research-purposes. 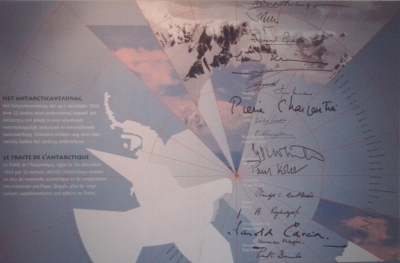 While in the meanwhile 39 member states work together without problems of nationality, politics, religion or skin colour, Antarctica can be considered as "THE" unique example for peace. But still some rules for environment should be considered. Antarctica and the surrounding islands are covered with ice for 95 à 98%. That means that seals and seabirds, especially penguins, have only a very small region left to breed. Here they build their nests, lay eggs and raise the chicks. But unfortunately these ice-free zone is also the most suitable place to build a station. There are about 70 stations, of which 45 are taken during the entire year. They have to be, just as for penguins, in easy reach from sea and have favourable micro-climate conditions. Most of the time, they didn't consider the negative impact on the penguins by building them. Penguins are disturbed by that building and the coming and going from the people. Moreover, their environment is loaded by dust, sound, gas fumes and by accident spilled oil and other toxic rubbish. In the earlier years, supervision wasn't too critical when oil-barrels, batteries and synthetic materials were unloaded behind the next hill. And sooner or later that material was simply burned down. Nowadays the pressure from conservationists is so large that, according to the Protocol of Madrid from 1990, all trash must return to the country of origin. Water treatment and returning the recidue from it, is also strongly recommended. The Protocol(1990) also bans mining for a minimum of 50 years. Beside the existence of the stations, you have to consider the supply and removal of materials and food. This happens by ship (which causes sometimes accidents : see oilspill) and then helicopters come and go to deliver everything to the station. It can't always be avoided that these flights (with a lot of noise) come over some penguin colonies. Results are: penguins out of fear leave their nests, leaving eggs and/or chicks to skuas and other predators. This too means a threat to the population of penguins. Sometimes they didn't consider the so-called "paths", made by penguins, when people build a station or runway. For example : emperors always take the same path from and to their colonies. When suddenly a obstacle appears on their way, they don't know where to go anymore and the results are obvious. Research also showed that decomposition products of DDT (since 1974 forbidden in the whole world) and PCBs can be found in the fatty tissue of penguins. You can ask the question : where are we going to and what are we doing to our own nature? When will this end?